Gross Margin, Gross Profit per unit and Total Gross Profit are simple calculations. You need to know your cost price (also referred to as item/unit purchase price) and the selling price (also referred to as revenue). 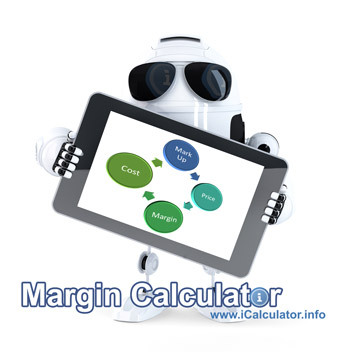 What is Margin Calculation used for? Margin Calculation is used to calculate profit from sales, that is the margin (difference) between the costs and sale price. Costs vary and should include all operational costs (logistics, staff, resource etc.). Do not make the mistake of using your purchase cost as the cost of the product as this does not include your time and additional operational costs required to run your business. With larger businesses, it can be difficult to define a true operational cost. Larger businesses and operations prefer to use a baseline margin, working on the knowledge that a 20% margin for example means approximately 8% profit after operational costs. Estimating is more common in large businesses whereas small companies tend to be more specific as every penny counts. The selling price is the actual price paid per unit by the consumer / user of the product or service. The Selling price should always be higher that the cost price in order to make a profit. On occasion, companies will sell at less than cost (supermarkets do this frequently). This creates a negative margin and financial loss. Intentional financial losses are typically part of wider marketing campaigns designed to increase customer interest in a product or other associated products. Selling at less than cost can be a 'below the line' sales technique. What is Number of Units? The number of units is the number of items to be sold. Say you have a bg of marbles, if you sell the bag as a whole it is one unit. If you open the bag and sell the marbles individually, then each of the marbles would become a unit. What is 'Mark Up' percentage? Mark up percentage is the percentage difference between The Selling Price and the Cost Price. 100% markup is the same as doubling the price. What is Gross Profit per unit? The Gross Profit Per Unit is the amount of profit made on a single item / service (a unit). What is Total Gross Margin? The Total Gross Profit is the profit after sale of all units / services.